Gold closed at $1,674.1 yesterday, gaining $16.9 to hit its biggest weekly rise in more than a month. This surge followed the ECB's decision to keep interest rates unchanged. Market sentiment also changed with Japanese gold futures reaching a high at around the $1,699 level, triggering some selling. However, continued buying from China before the Lunar New Year is having a positive effect. In addition, with Chinese consumer inflation reaching a seven month high in December, spread trading investors have previously turned to the precious metal as a hedge and this appears to be happening now. Good news across the board, with reassurance of better days ahead from the ECB and a return to steroids for the Chinese economy, quickly spilled into the energy complex. Oil investors took advantage of the opportunity, sending the price of WTI crude $0.69 up to $93.83. The live oil chart shows that the short-term uptrend is still intact. Gold closed at $1,657.5 yesterday, with a key resistance level around the $1,660 mark. The market was little changed, slipping by just $2, as investors await today's key ECB decision on interest rates. The precious metal is edging up slightly this morning after better-than-expected Chinese trade data spurred optimism that demand for commodities will remain sturdy in the face of a strengthening dollar. Despite a gain in shares, crude prices barely moved yesterday, finishing a mere $0.10 up at $93.20 a barrel. Furthermore, the US Department of Energy reported its weekly inventories, showing a surge in stockpiles, but crude prices again failed to react. Nevertheless, oil prices are already on the offence this morning following a strong rise in Chinese trade surplus. Gold closed at $1,660.3 yesterday, rising $13.1 as investors took bullish positions ahead of policy decisions from Japan and the Eurozone. Japan is considering easing monetary policy again and interest rates are expected to remain unchanged in an ECB meeting on Thursday. The precious metal's price was also buoyed by continued physical demand from Asia, this time coming notably from China before the Lunar New Year. Last week, gold fell to a four-month low below the $1,630 mark and many believe that the sell off was excessive. In particular, there were no clear signals that the US would actually stop their bond purchasing programme any time soon. CFD investors are keeping their eye on the real interest rate, that is the rate with inflation taken into account, as a clearer signal to sell. Higher rates mean an increased demand for the dollar and so gold tends to depreciate. WTI crude oil had another quiet session yesterday, dropping just $0.16 to $93.12 a barrel in a very tight range. The US Department of Energy will release its oil inventories report later today and there are some expectations that stocks could rise, putting downside pressure on the price of crude. Having said that, this might be counterbalanced by the elevated prices for oil products. The gold market closed at $1,646.6 yesterday, down $10.5 as worries remain over the longevity of the Federal Reserve's bond purchasing program. A weaker dollar was also a factor, but policy makers are concerned about the side effects that stimulus measures may have in the world's largest economy. Having said that, stronger demand from Japan, where pension funds are looking to double their holdings in line with government inflation targets, is aiding the precious metal and support lies at the $1,630 mark. As we move into the US earning season, online spread trading investors seem to have remained fairly optimistic about the energy sector and so they pushed Nymex crude oil another $0.18 higher to $93.28 a barrel. The world's second biggest economy, China, will release some economic results this week and, baring a big surprise to the downside, this should help support demand for oil. Gold was out of favour with investors again on Friday, as a lack of surprises from the US economic recovery pushed participants out of precious metals and into riskier assets. Gold lost another $6.9 to close at $1,656.4 after reaching an intraday low of $1,625.5. We can see some bargain hunting this morning, but it remains to be seen whether it can last. The US employment figures were only marginally above estimates but enough to keep energy investors confident that the demand for crude will stay well supported. As a result, WTI crude oil continued its rise, gaining $0.22 to $93.04. The gold spread trading market tumbled by $22 yesterday as Federal Reserve policy makers expressed their conviction that the easing stance might have to come to an end rather soon. A stronger dollar accentuated the decline, which seems to be carrying on this morning. WTI crude oil ended rather flat at $92.79 yesterday after the FOMC minutes signalled that the current stimulus program will come to an end this year. However, considering that the rise in the dollar would normally have had a bearish influence on oil prices, energy investors held their ground. This may have come on crude oil analysis grounds as the chart indicates both a short and medium-term uptrend. Gold closed up at $1,685.7 yesterday and this morning it continues to remain at a two week high as the dreaded fiscal cliff was headed off by a deal. 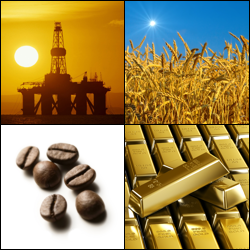 Congress has spoken, the commodity markets have been sparked into moving and traders are reacting. Even though many challenges remain for the world's largest economy, governments around the world have raised their demand for the precious metal as a store of value. Gold rose by around 7% in 2012, making a twelfth straight year on the up, and many think that this good run will continue into 2013, supported by global policy maker's decisions. The risk-on sentiment also spilled into the energy complex yesterday, pushing crude oil prices $0.43 higher to $92.84 a barrel. From a technical analysis perspective, we had a bullish signal as the 9 day moving average crossed above the 40 day moving average. However, some light profit taking is already under way, with all the attention shifting onto Friday's US employment report. Gold has started the year on the front foot after closing at $1,672.6 on the last day of 2012 and rallying past $1,680 already today. The precious metal is currently at a two week high, gaining along with other commodities after Congress finally passed a bill to avoid the $600bn fiscal cliff. Gold prices were supported as the dollar weakened by around 0.4% against a six currency-basket. In addition other supportive factors, such as low interest rates and accommodative central bank policy, remain in place. However, even though the US will avoid going over the fiscal cliff right now, other budget talks now lie ahead in the next two months and investors, particularly in Asia, are watching to see how things develop. The precious metal is at $1,684 at the time of writing and support and resistance levels are seen at $1,668/59/52 and $1,694/1,702 respectively.